For the KrAZ aluminium smelting company in Russia, see RUSAL. For the U.S. radio station, see KRAZ. KRAZ trucks Moscow, Russia at MIMS 2006. Vehicles are KrAZ-65032 dump truck (red truck) and KrAZ-6140TE semi-trailer truck. KrAZ (Ukrainian: Кременчуцький автомобільний завод, Kremenchutskyi Avtomobilnyi Zavod, Kremenchuk Automobile Plant) (АвтоКрА́З or AvtoKrAZ) is a Ukrainian factory that produces trucks and other special-purpose vehicles in Kremenchuk, Ukraine; particularly heavy-duty off-road models. The factory was incorporated as a holding company combining several other factories nationwide and becoming the industrial wing of the finance-industrial group "Finance and Credit" that also holds the Bank Finance and Credit. Kraz was founded on 31 August 1945 when the People's Commissariat for Transportation Routes issued a warrant to build a mechanical bridge plant in Kremenchuk. The first brick was laid in the plant foundation in 1946 and during the next 8 years it produced about 600 bridges with the total length of about 27 km for use on the Dnipro, Moscow, Dnister, Volga and Daugava rivers etc. In 1956 the plant has manufactured combine harvesters and other farming machines. The Kremenchuk Combine Plant has produced 11,000 agricultural machines in the first two years of its existence. 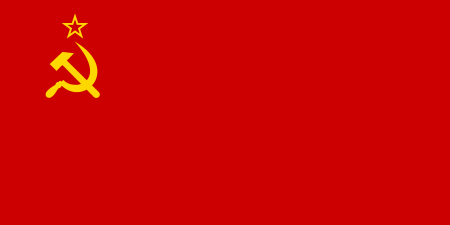 On April 17, 1958 the Central Committee of the Communist Party of the Soviet Union decided to build a plant for heavy-duty vehicle production in Kremenchuk. Heavy-duty truck manufacture was transferred from the Yaroslavl Motor Plant (YaAZ). 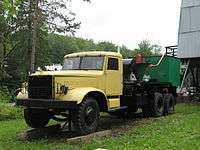 The first two KrAZ-222 dump trucks were assembled from imported units and components on 10 April 1959, and by 1961 the plant exported over 500 vehicles in 26 countries of the world such as Argentina, Afghanistan, Bulgaria, China, India, Vietnam etc. KrAZ was awarded the Order of Lenin in January 1971 for completion of the five-year plan ahead of schedule and successful developments of new truck models. On January 15, 1976 the plant became "AvtoKrAZ". By 1986 the company's yearly production output totalled 30655 vehicles. The Kremenchuk Automobile Plant was registered as an Open Joint Stock Company in 1996. 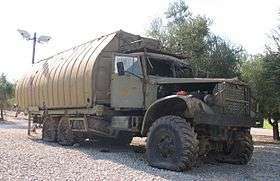 The holding company "AvtoKrAZ" was registered in 1999. 2002 witnessed the start of privatization with the "AvtoKrAZ" block of stock being purchased by a joint Ukrainian-German enterprise "Mega-Motors". In 2003 AvtoKrAZ opened vehicle assembly plants in Russia and Vietnam. 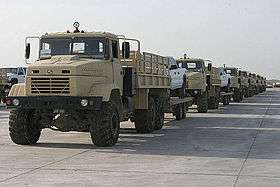 In 2004 "AvtoKrAZ' was awarded an order for 2200 KrAZ vehicles to be delivered to Iraq. AvtoKrAZ received an ISO 9001:2000 for quality control. In January 2006 the 800,000th truck was assembled at the KrAZ main assembly plant. In October of the same year HC "AvtoKrAZ" won the first prize among 100 Ukrainian companies with the best rate of development according to the net profit growth pursuant to the results of rating "Top 100 Most dynamic companies"
On August 23, 2011 the KrAZ-5233 "Spetsnaz" has entered into service with Ukrainian army. After the Financial crisis of 2007–08 orders for vehicles declined drastically as Ukraine was severely effected by the event, the factory worked at minimal capacity. However,during the 2014 Russian invasion of Ukraine the government of Ukraine placed large orders for new military vehicles. 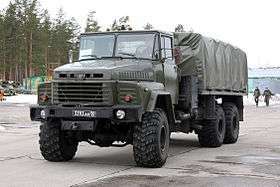 The Border Guards, National Guard, and Army of Ukraine have all been scheduled to receive new KrAZ armored trucks. Moreover KrAZ partnered with the Canadian defense firm Streit Group to produce the Cougar and Spartan armored vehicles. A total of 21 Spartans were ordered with the Ministry of Defense having an option for an additional 40, 20 Cougars were also ordered. Several Streit Group Spartan APC's were seen at the Kyiv independence day parade indicating that the order was at least partially complete. In November 2014 Ukrainian government placed an order for 1200 vehicles and 200 armored personnel carrier to the factory. The contract was worth 1 billion UAH ($64,267,360.00). A Kraz 255B, Finnish Defence Forces, used also as a vehicle for the PMP Floating Bridges. 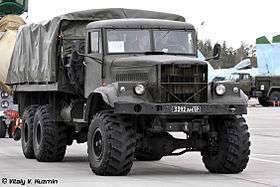 KrAZ V12.2MEH - 6×6 - ? These are designed to be fitted with various body equipment for paved and dirt road use. The follow on to the KrAZ-255, the KrAZ-260. Here ia a former NVA of DDR. 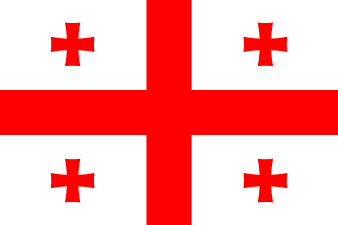 ↑ "Холдинговая компания АвтоКрАЗ. Производство, продажа и поставка тяжелых грузовых автомобилей и автомобилей специального назначения, а также запчастей к ним. Сервис, станции техобслуживания". Autokraz.com.ua. Retrieved 2009-12-25. ↑ "The National Guard of Ukraine will receive 21 KrAZ Spartan LAVs". Info News. 10 Aug 2014. ↑ "ВСУ получат тяжелое вооружение на 1 млрд грн". Information Resistance. This article is issued from Wikipedia - version of the 9/20/2016. The text is available under the Creative Commons Attribution/Share Alike but additional terms may apply for the media files.